A woman is sitting in a chair, her face slightly battered, paralyzed. A fly is slowly walking across her face, and she can’t move — even when the bug walks over her opened eye. 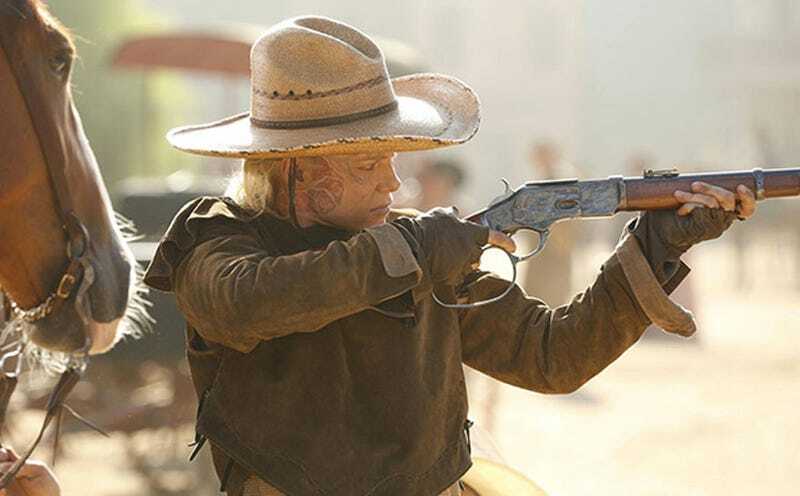 She can hear a male voice in her head, asking, “Do you want to wake up?” It’s the first extended look we’ve gotten of Jonathan Nolan’s series Westworld, and it was intense. Previously, HBO had only released a 3-second teaser, and the trailer we saw a surprise at the end of the Person of Interest panel this afternoon at Comic-Con. Show creator Jonathan Nolan — who also wrote the Batman movies and Interstellar — told us he had gotten so obsessed with AI themes in Person of Interest that he “decided to do a whole show about it.” And we got a taste of what’s to come. As our character struggles to wake up from her terrifying dream in that opening scene, we get a violent, super-saturated look at scenes from the show. The series is based on a 1973 movie, written by Michael Crichton, about an android meltdown at an old west theme park. The gunslinging androids and lovely ladies of the evening, there for the fun (and abuse) of guests, suddenly turn murderous. But in Nolan’s version of the story, it seemed as if perhaps there might be an element of virtual reality in the series too — hence the dream from which our character can’t wake up. The voice in the woman’s head even says, “Have you questioned the nature of your reality? We see a barrage of dreamlike sequences, of violent confrontations in the old west theme park Westworld, but also futuristic, scifi scenes that are clearly from the Futureworld theme park too (which was where the 1976 movie sequel took place). The effect is something like a terrifying genre mashup, with elements of the western spilling over into scifi, and all being linked by horrific, bloody confrontations. We also catch a glimpse of a lab, where androids are being manufactured in gleaming chrome frames, while Anthony Hopkins intones, “You can’t play God without being acquainted with the devil.” There are also moments — perhaps in the lab, perhaps in Futureworld — where people are being experimented on, and needles stabbed into their eyes, and other creepy stuff. Given that Nolan introduced the teaser by saying he made an entire series “about AI,” I think we can expect this show to deviate from the original Westworld in one important way. In the original movie, the androids in the theme park start killing humans because they are malfunctioning, not because they’ve become sentient. Yes, there are hints that perhaps the machines are sick of humans shooting and abusing them — but that’s never really explored. It’s more like an early version of Crichton’s novel Jurassic Park, exploring how theme parks are microcosms of human social planning — full of incredible ideas, but poorly executed and very dangerous. But in Nolan’s version, I think it’s pretty obvious that the androids or cyborgs are going to be actually pissed off at the humans in their amusement park. And maybe, if the humans are actually going into a virtual reality space, they will be trapped inside an AI-generated fantasy, unable to escape. Either way, these aren’t just broken bots. They are sentient beings, and they are going to have feelings and opinions of their own. Given how alien and complex the AI characters are in Person of Interest, I think we can expect great things from this series.